Wondering how to water a lawn? Sadly, it’s not quite as simple as just turning on the sprinklers and walking away. The number of times you water your lawn throughout the year and how much water you give the grass matter—so if you’re foggy on the details, allow this latest installment of our Lawn Lover’s Guide to show you the ropes! Read on to learn how to water a lawn, and when, how often your grass needs water, and a whole lot more to amp up your lawn care. Grass may not be as difficult to maintain as a vegetable garden, but if you want to keep your yard looking green and gorgeous, you can’t just treat it with benign neglect. Aerating, seeding, and watering your lawn are all part of keeping your curb appeal intact. If you stop watering your lawn entirely, warns Chris Bartells, owner of Green Mountain Turf Sprinkler Repair in Lakewood, CO, you’ll start to notice brown patches emerging in a matter of weeks, as the grass begins to lose moisture. “Pretty soon, your lawn will be more brown than it is green, the soil will harden, making it harder for water to penetrate it when you do water it, and will likely need a reseeding if you ever plan on restoring it to its former glory,” Bartells says. There is one exception to the watering rule: If you live in a climate where it rains regularly or you’re going through a rainy spell, it’s OK to skip out on watering your lawn—it can actually be more harmful to your grass to overwater, increasing the risk of grass disease. That said, you probably need to water your lawn, so let’s talk about how to do it the right way. Before you even think about hitting the grass with a steady spray of water, you’ll want to make sure you know the best time of day to do it. Although many folks assume night time is best, most experts will tell you that’s a myth. Another no-no? Watering in the hottest part of the day. Although you may think your thirsty lawn wants a drink midday, the heat will cause evaporation to happen quickly, before water has had a chance to reach the roots of your grass. The best time of day to water is in the morning, if possible some time between 4 a.m. and 10 a.m., Botts says. 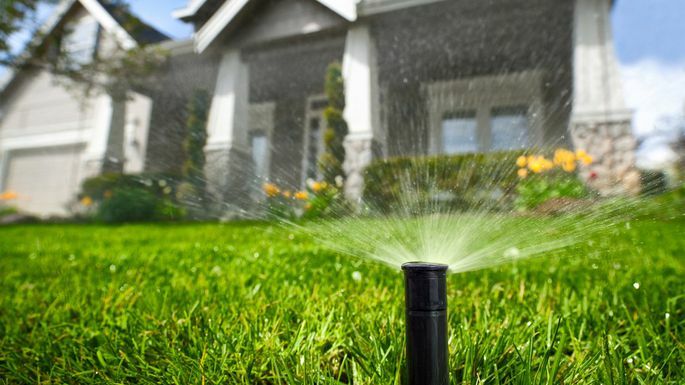 If you’ve moved into a home with sprinklers already installed in the lawn, you’re in luck. They will do the bulk of the work for you. Bartells suggests placing a few empty cans of tuna or cat food in the spaces between your sprinkler heads, then turning your sprinklers on, allowing them to run for 15 to 20 minutes. Depending on your soil type, you may want to water your lawn all at once, or break it into two or even three equal applications throughout the week. Longer stretches of watering are better for the lawn than quick daily sessions. “You want deep roots, but watering them for short amounts of time daily instead of watering them for 20 minutes or so once a week or every other day is like splashing them with water without actually letting them drink it,” says Bartells. Watering your lawn when you don’t have sprinklers means more work for you, but just looking at that gorgeous greenery will ensure that hard work is worth it. Botts advises investing in a rain gauge, so you can determine just how much water your lawn is getting from nature. If it’s less than 1 to 3 inches, you can set up a rotating sprinkler (the type kids like to run in and out of during the summer works well), setting it in one part of the lawn for 15 to 20 minutes, then moving to spots that weren’t reached and allowing it to run again for 15 to 20 minutes and so on. The tuna can trick works here too, and will help you gauge just how long to run the sprinkler. If you don’t have a sprinkler, you can use a hose, with the nozzle attachment set to “sprinkle.” Be sure to move around the yard, hitting all areas of your lawn with the water. If your lawn has clay-based soils, you’ll want to water once a week, Botts says. If you have sandy soils, you’ll probably need to water every three days or so. “If there are sloped areas in your lawn where water runs off quickly, spots where the afternoon sun roasts harder than others, or areas that are heavily shaded, you may have to pay extra attention to make sure that your lawn is getting enough water,” Botts adds.